There is nothing wrong with makeup, tanned skin, nice threads, or perfect hair. There is nothing wrong with Instagram likes, Twitter favorites, or Facebook comments. There is nothing wrong with having a boyfriend (if it’s a healthy relationship). There is nothing wrong with any of these things but… what would happen if they were all taken away? Would you still feel beautiful and confident? Is your worth outside of the worlds validation? Think about the things that make you feel most beautiful. What are they and how much do they cost? And, is what God says about you at the top of that list? That last question is important and I want you to answer it truthfully. Outside of this world, with its magazine covers constantly spilling over with beauty tricks and tips and photoshopped models who are considered perfect, do you know your worth? When someone says to you that you are fearfully and wonderfully made, do you truly believe it? When you read about what God says about you, do you actually accept it? Could Gods love for you and His validation be enough? Today, I want to remind you of what He says and I want you to walk in His validation- I want you to start making the choice to be content with knowing that God says you’re enough. It’s such a simple phrase, but do you walk in it? He loves us more than our parents, our friends, and your boyfriend.. He loves every part of you, even the parts you hate about yourself. Here is one of many verses that God says about His love for you. Look back over that passage, let’s put it into another context in relation to beauty. The devil loves to lie to us about our beauty. He likes to whisper to us when we look in the mirror saying, “My my.. You’re too fat to be loved.. Who could love someone so ugly? You’re not beautiful like those other girls. You need to cover that face up. Without makeup, no one would like your face.” But notice.. Notice how Romans says, “Despite all these things, overwhelming victory is ours.” Despite all the flaws we see in the mirror, despite all the lies the devil whispers in our ear on a daily basis, we have OVERWHELMING VICTORY! We win! Through Christ LOVE for us, we overcome the negative self image. We overcome and walk in the beauty that is the love of our Heavenly Father. Nothing can separate us from that love. Not our acne, not the anxiety that caused it, not our insecurities, nothing, nada, zip. Being loved brings validation. Being loved makes us feel beautiful. When we realized how much we are loved we begin to realize how truly beautiful God made us to be. If you didn’t have worth, why would God give something so precious for you? Why would He send His son as payment for your heart and your life if you didn’t have any value? He wouldn’t! He made you, He sees you, and He saw you to be so valuable, so beautiful, so talented, so worth loving that HE HAD TO HAVE YOU! Do you see it? Can you feel it yet? You have worth and value that goes beyond that of a coin, a boys flattery, a mere like/favorite on your selfie, you are worth SO MUCH MORE THAN THAT! The next time the devil tries to degrade your value, you remind him of the price that was paid for you! It was a sacrifice that cannot go unnoticed for it was a sacrifice of three nails, a crown of thorns, a bloody cross, and the keys to Hell. That, that is the ultimate price to pay. You. Have. Value. It sounds cliche and so Christianese but you are worth dying for. Lastly, you are beautiful. You are so beautiful. You’re not just beautiful because you are loved, you’re not just beautiful because you have value, but you are beautiful because you were created by the hands of God and in His image. “So God created human beings in His own image..” Genesis 1:27. It might be a bit bold for me to say this but, when we stand there in the mirror body shaming ourselves.. Are we not then shaming the image of God? Convicting thought for me! It’s difficult for me to write it down because it hits me square in the face. How many times do we stand in front of the mirror and comment about our “thunder thighs” or our “uber long torsos” or our “short stubby legs” or “arm flab” or “back fat” or “insert problem here”…? How often do we look at what God has made, what He has designed after His own image and call it a plethora of negative names? You are beautiful because God made you that way. 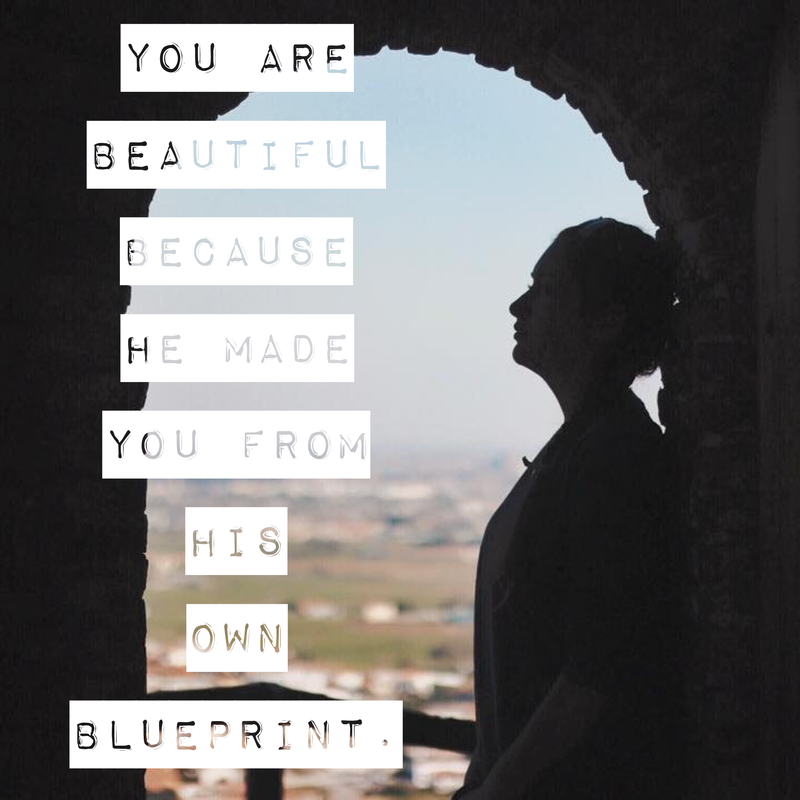 You are beautiful because He designed you from His own blueprint. I know I already said lastly, but there was one more point I wanted to make. I pull it out from Isaiah 52:7,”How BEAUTIFUL on the mountains are the feet of the messenger who brings the Good News, the good news of peace and salvation..” When we understand how much God loves us, we come to the understanding of the value we have through Him. When we understand that we are made in His image, then we begin to seek to be like Him. Being like Him means having a heart after His own heart. Going back to the verse, it has been in my experience that the most beautiful I ever feel is when I’m walking out my God given Calling. When I am sharing the good news of Gods everlasting love in the way He designed me to, I feel completely whole. Wholeness brings confidence that the life we are living is worth something. That confidence cannot be shaken through the outward appearance because it is so deeply rooted in our souls that we begin to care less about the outward appearance. The beauty of a life and heart set on fire for God shines so much brighter than any worldly man made beauty. Find your calling. Walk in wholeness. Know you’re beautiful and accept it. Understand the depth of your value and always remember that you are loved. Write down what makes you feel beautiful. Write these Scriptures on your mirror, hang them in your closet. Somewhere where you are reminded of your worth before you go out and seize the day. YOU ARE A DAUGHTER OF THE MOST HIGH! Know this much, you are so so so loved and the Lord sees you as His daughter, whom He is well pleased. Take 5 minutes to tell an absolute stranger how valuable they are- I think you will be overwhelmed by the response you will receive. < Previous Jesus, you gave us some cool friends. Next > He is more than enough for me. Thank you for this beautiful reminder! It is such a powerful message. I am sharing this. Godbless!!! That is so encouraging, Claire! You are amazing and a piece of work that the Lord is proud enough to call child. Go tell it everywhere, sweet sister! Reblogged this on Maggie Parsons.